1. 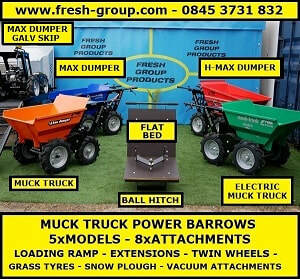 This is a video overview of the muck truck power barrow range and accessories. 2.This video shows the towing capabilities of the muck truck. The muck truck tow hitch accessory can be fitted in seconds to the front of the muck truck skip for moving trailers, caravans, horse and boat trailers and a lot more. 3. 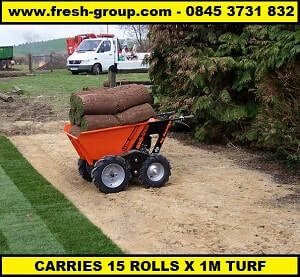 One muck truck power barrow with its many accessories can do the job of multiple machines without the extra expense. 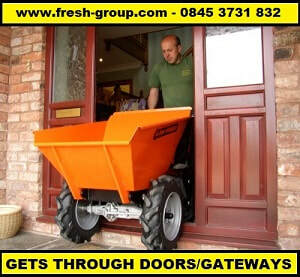 This video show some of the work possibilities of this amazing power barrow. 4. Video of a muck truck power barrow moving cement bags up steep hills. 5. 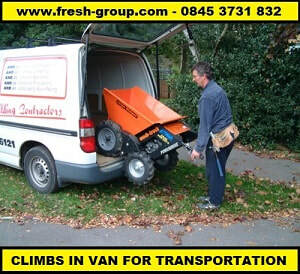 Video showing the muck truck climbing up steps and hills as well as descending with or without a load without endangering the operator. 6. 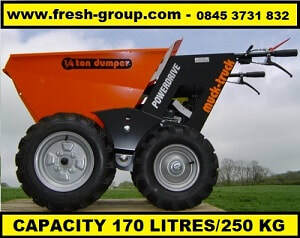 The muck truck power barrow with the snow plough attachment can clear snow very quickly as shown in this old video. 7. 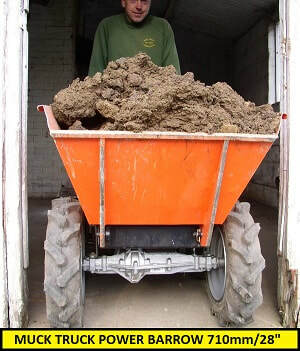 Old video showing the timeless muck truck power barrow transporting ruble and heavy stones up a ramp into a container.